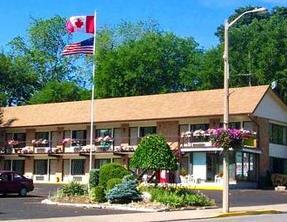 The Econo Lodge West of the Falls is located on the historic site of the Battle of Lundy’s Lane in Niagara Falls Ontario. This motel is also located only a short drive from some of the best area attractions, dining, shopping, and the majestic Horseshoe Falls. This newer property offers clean, spacious and affordable non-smoking accommodations with some of the latest amenities to make your stay more enjoyable. Some of the great amenities include free parking, free local calls, and free wireless internet.